Do you like deviled eggs? Do you love avocado? Let’s combine both, skip the mayonnaise, and make some easy 3-Ingredient Guacamole Deviled Eggs. This post contains at least one affiliate link, which means if you click it and make a purchase I may earn a small commission at no cost to you. See my disclosures page for more information. I cooked a bunch of hard-boiled eggs, thinking I’d eat them as snacks. Eventually, I wanted something a bit more interesting and noticed a tub of guacamole in the refrigerator. 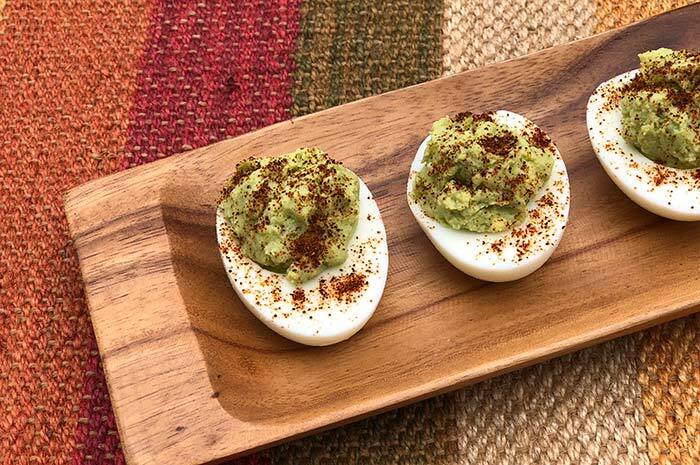 Since I use smashed avocado often as a substitute for mayonnaise, I wondered how guacamole would taste in deviled eggs. Creamy and delicious, as it turns out. On the stove – My favorite stovetop technique is from Debbie Moose’s cookbook, Deviled Eggs: 50 Recipes from Simple to Sassy. This was my go-to until I got an Instant Pot (see below). In the oven – Intrigued by a show I watched on Food Network, I tried “boiling” my eggs dry in a muffin tin in the oven. The eggs cooked okay but had what looked like little rust spots all over them (and, no, my pan wasn’t rusty). This technique was certainly the easiest, but I don’t think I’ll use it again. Via Instant Pot – By far, my favorite way to hard-boil eggs is in the Instant Pot. I use a silicone egg rack, stand the eggs fat side down, and cook them for 2 minutes on High pressure with a Natural release. They turn out perfectly and are so easy to peel! No ice water bath required. Use your favorite store-bought guacamole or make your own. For a hint of sweetness, try Mango Guacamole. For a pretty presentation, pipe the guacamole-egg yolk mixture. If you don’t have a pastry bag, simply cut the tip off a corner of a zip-style plastic bag and use it instead. The recipe scales quite nicely. Cook as many (or as few) eggs as you’d like and use 1 tablespoon of guacamole per egg. Pop out the yolks into a small bowl. Add guacamole and mix well. Spoon or pipe mixture back into egg white halves. Sprinkle with chili powder and serve immediately or refrigerate. This recipe scales nicely. Cook as many (or as few) eggs as you'd like and use 1 tablespoon guacamole per egg yolk. Those are such a good idea! I’m not a fan of mayo so I love the idea of using avocado! Liz – I like mayo less and less these days. Love avocado though!